What I love about research is the opportunity to think about a subject in-depth and to develop new insights and new connections between ideas and issues. It's great to generate new knowledge and be the first person or team to think about and write about something. 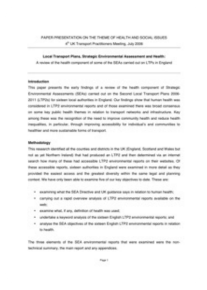 This paper presents the early findings of a review of the health component of Strategic Environmental Assessments (SEAs) carried out on the Second Local Transport Plans 2006- 2011 (LTP2s) for sixteen local authorities in England. Our findings show that human health was considered in LTP2 environmental reports and of those examined there was broad consensus on some key public health themes in relation to transport networks and infrastructure. Key among these was the recognition of the need to improve community health and reduce health inequalities, in particular, through improving accessibility for individual’s and communities to healthier and more sustainable forms of transport. analyse the SEA objectives of 16 English LTP2 ERs in relation to health. This project was funded by the European Sixth Framework Programme for Research and Development and ran for one year from December 2004 to November 2005. The European Union has enacted the Environmental Impact Assessment (EIA) Directive to ensure the assessment of the environmental effects of those projects which are likely to have significant effects on the environment. A report of the Commission has revealed that there are still various weaknesses in the Member States implementation. 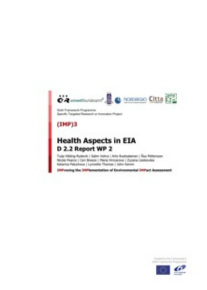 This report deal with the health aspects in EIA work package. Community concerns and protests at the siting of technological facilities in their neighbourhoods have increasingly been recognised as important social phenomena. 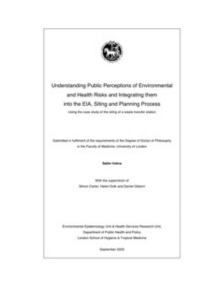 This thesis describes a qualitative study exploring this issue during the siting and planning process for a waste transfer station in an urban neighbourhood in London, England. It shows that individuals and communities are intuitive, emotional, imaginative and reasoned in their responses to such siting processes. In effect, they seem to be undertaking a wider, largely qualitative, form of risk and hazard assessment that takes into account their own personal and professional experiences as well as long term social, economic and political factors. 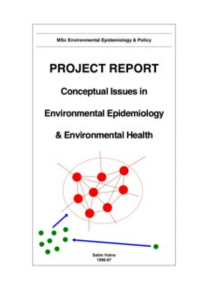 This project aims to explore some important conceptual issues in environmental epidemiology and environmental health. These issues have been framed in the broadest possible terms so that their scope can encompass epidemiology and environmental health as a whole. Hence, my objective in this project is to attempt the development of a theoretical schematic framework-model-map placing the various levels of analysis in context to provide a practical tool for looking at the interaction, impact and importance of factors leading to health and disease. To look at how a complex systems framework-model - a qualitative scientific model - can be developed that encompasses these ideas and links up to and expands upon existing models in epidemiology like the web of causation. I hope to show how this expanded framework-model not only has implications for research epidemiology but also links up to the development of a complex systems-based framework for environmental health.